HONG KONG, April 13, 2019 /PRNewswire/ — REMO TECH Co. Ltd., creators of artificial intelligence brand OBSBOT, is showcasing their flagship camera OBSBOT Tail, which is the world’s first AI-powered autonomous director camera, at the Hong Kong Electronics Fair 2019. OBSBOT Tail uses AI-based subject recognition to detect and track people & pets with unprecedented accuracy. 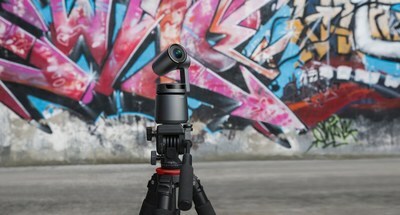 Offering half a dozen filming modes that autonomously capture memorable candid moments using its patented AI imaging algorithms, it gives the liberty of handsfree operations to video creators. In January 2019, OBSBOT Tail was introduced to crowd-funding community of Kickstarter and during the campaign raised 800%. OBSBOT Tail is mostly taken by artists and video creators because of its ability to track the subject and record in 4K without having someone to hold, tilt, zoom. To learn more about OBSBOT Tail, visit http://remo-ai.com/. OBSBOT, an artificial intelligence camera brand by REMO TECH, is dedicated to connecting people and the imaging industry to the future, by pushing the boundaries of technology and inspiring more groundbreaking innovations in the field of photography. With the first flagship product ‘OBSBOT Tail’ the brand offers a radical new way to easily capture footage with an all-in-one AI camera, capable of tracking, auto-zoom and gesture control, empowering you to be your own actor and director. OBSBOT Tail, first unveiled at CES 2019, where it was acclaimed as an “Innovation That Stole the Show” by Variety Magazine, while Slashgear hailed it as the “Best Content Creation Equipment” at CES. The OBSBOT Tail was also pegged as one of the “Coolest Tech” by USA Today. With the wave of change gripping the imaging industry, sparked by the introduction of artificial intelligence technology, OBSBOT strives to break technological barriers and inspire the way people record their lives. The media kit can be accessed here.